The Aris Caves is an independent lodging, carved in the volcanic rock and oriented to the Caldera, which enjoys stunning views of the sea. It has free buttons service. The Aris Caves offers exclusively furnished rooms. Please inform Aris Caves in advance of your expected arrival time. For this, you can use the special requests section when making the reservation or contact the accommodation directly. The contact details appear on the booking confirmation. This hotel is located next to a cliff and has low perimeter walls, so it is not suitable for children under 8 and people with reduced mobility. Please inform the property in advance about your expected arrival time. You can indicate this in the comments section of the booking form or by contacting the hotel. The contact details appear on the booking confirmation. Traditionally furnished studio with vaulted ceilings and a kitchenette, seating area and patio. This studio does not have capacity for extra beds. 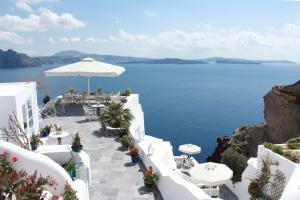 Studio with a large terrace with full views of the volcano, the Caldera and the Aegean Sea. Includes 1 bedroom with seating area, kitchenette and private bathroom. There is also a hot tub. Traditional apartment with vaulted ceiling, interior arch, stone built beds, 1 separate bedroom, living area with kitchenette and access to a furnished terrace. It has capacity for a maximum of 4 people. Spacious suite with a wooden gallery, a loft bedroom, a master bedroom with an iron bed and a living-dining area with a kitchenette and a sofa. It offers access to 2 furnished terraces, one larger than the other. Rooms of this type can accommodate 7 guests. Large studio built directly on the hillside. It includes an open-plan living area with a double bedroom and a kitchenette. It also has a private patio and a large private terrace, elevated and furnished. 2 level apartment with wooden gallery with 2 integrated beds, 1 double bed and living / dining area. It includes a kitchenette that opens onto a furnished terrace. The accommodation can accommodate up to 4 guests.